40,000 years ago a process of incremental transformation unfolded along the Indonesian archipelago. This was sustainable change all but invisible yet the very languages and cultures of the archipelago’s forest people were enmeshed and entwined in this process. For the most part, given the low population densities, it left closed canopy forest undisturbed, except for swidden clearings. Swidden or shifting cultivation had minimal impact on closed canopy rainforest unlike the more recent Slash and Burn farming techniques. Almost 30 years ago, on an extended four-month journey through East Kalimantan and Sumatra, my expectation was an encounter with myriad plants and animals, of complex ecosystems optimising life forces and climaxing in total profusion. How wrong I was. Along East Kalimantan’s Mahakam river deforestation was extensive, rafts of logs floated down the great river, the primary rainforest was seldom seen, except on side trips along tributaries flowing through riparian swamp forest or peatlands. The same was true in Sumatra except for the Bukit Barisan, reserves and national parks. Valuable timbers had been felled, first replaced by rubber plantations and then oil palms. Only in the Mentawai Islands did I begin to see what I had imagined, elsewhere exploitation of forest resources had already entered a new era though this space was also threatened. Logging and plantation development, particularly on mineral soils was extensive. In Sumatra after valuable timbers were extracted, large areas were developed as rubber plantations which, after the development of synthetic rubber, were replaced by oil palm plantations. In both Kalimantan and Sumatra peatlands remained as refuges for a time, as places where complex ecosystems were still to be found. The United Nations FAO reports Indonesia’s forest cover in 1990 as 1,185,450 sq kms, by 2010 this was reduced by 20.3% to 944,320 sq kms. Just last week I had a text message from my friend Ridwan who lives in Sungai Tohor, a district on the island of Tebingtinggi, in Riau Province. Tebingtinggi is part of the Meranti Island group lying on the western side of the Malacca Strait. His community is engaged in several projects aimed at restoring and establishing sustainable forms of farming. His story will form the next in a series of blog posts. Riau is bordered on the west by the Barisan Mountains. Its total area is 8,702,400 hectare. Four major rivers, the Rokan, Siak, Kampar, and Indragiri Rivers flow into the Malacca Strait forming hill lands that rapidly expand into extensive peatlands. Originally most of the vegetation cover started out as closed-canopy forest. About 40% of the province, around 3,400,000 hectares, is coastal peatland. The other 60% was equatorial forest established on mineral soils or, along the extreme coastal margins, nipa palm swamp and mangroves. Riau’s mountain slopes still have forest cover while its hills and peatlands have been extensively cleared for plantations and farm land. The plantations involve oil palm cultivation and areas of industrial forests, where timber companies cultivate eucalypts, acacia and teak for timber and wood pulp. There is also some and farm land. Riau’s peatland was laid down from the end of the Pleistocene Ice Age. On its seaward margins it forms the stabilised Holocene coastline. Here are Indonesia’s deepest peat deposits reaching over 10 meters depth and storing an estimated 16.4 gigatons of carbon, almost 25% of Indonesia’s total deposits. The province has been subjected to rapid and extensive deforestation. From 1990 its total forest area was reduced by 65 per cent and its peat forest cover from 80 per cent in 1990 to about 36 per cent in 2010. Until 1998 and the fall of Indonesia’s Suharto regime there was far more control of forests from the national level. Now through changes in law and regulation there has been a greater devolution in authority. Arnold notes in his article Deforestation in Decentralised Indonesia: What’s Law Got to Do with It?’ This was addressed in my earlier post Impacts of and responses to the dense smoke haze from #Indonesia. With the passing of new regional autonomy and fiscal laws in 2004, regional governors and assemblies received a greater share of power. Regions are now able to exercise extensive autonomy over specific areas of governance, including forestry, provided that their decisions maintain social welfare, public service and regional competitiveness. At a provincial final authority rests with provincial government, districts/municipalities have jurisdiction over everything that is at that level alone. This leaves space for much ambiguity as provincial, regional and district boundaries rarely accord with discrete bio-geographic regions. Many trans-boundary issues arise. To make matters more complex, provinces can ‘delegate’ authority to districts and/or municipalities, which can I turn delegate authority to villages. Authority over forestry can be so delegated. Some indication of the land use and tenure of Riau province can be gleaned from this map in Figure 3. This map shows the proposed change in the forest area of Riau province based on the recommendations of an integrated team study. It forms the basis of a revised spatial plan for the province. Figure 3b: Map key showing changes in land use and forest exploitation proposed. The shaded areas show the proposed change. The map makes plans for further exploitation of Riaus forests abundantly clear. I will say more about this in subsequent posts. Further detail on Riau land use can be observed in the transect map I have prepared. If you intend using any of the images linked to this map, please clarify the image content with me first and also acknowledge this blog on publication. Devolution has ushered in a confusion of powers and responsibilities so it isn’t surprising that poorly regulated fire based land clearing techniques in Riau’s peatlands led to the catastrophic fires of 2015. This has also been covered in my earlier posts, particularly in Peatland and forest burning for palm oil production continues, but at what cost? Legal and regulatory ambiguities afforded opportunities for poor decision making and corruption. The added problem of rural poor wanting a secure income source facilitated low yield unsustainable slash and burn agriculture. There is no absolute sequence of steps but there is a frequent pattern in the destruction of closed canopy forest. Selective logging over a 20-year period. Logs are can be removed using push carts on portable light rail systems or slid along tree trunks. This opens of the canopy, as shown in Figure 6, lowering humidity and making forest prone to fires in dry periods. If selection cutting is carefully controlled such impacts can be contained but regulation is difficult. Research conducted in the Mentawai Islands demonstrated the effect of logging just 8% of trees by selective logging led to destruction of 19% of the surrounding forest, 20% of forest was badly damaged with crowns and bark stripped, 7% of trees were seriously broken and 46% remained intact. When this takes place it can involve the use of small streams for log transport. Being non-selective this type of extraction can cause irreversible degrading of the forest ecosystem and loss of forest cover as shown in Figure 7. Drainage of peat is essential for any agricultural crop (except for sago on the coast). In some cases, small ditches left from previous illegal logging are used to assist peatland drainage. Once an area is dry fire is the cheapest means available for land clearing. On peatland, without rain, fires can smoulder and farmers are neither motivated nor do they have the capability to extinguish fires. When rains don’t come, as in the El Nino year of 2015 fires can spread, raging out of control. Next the opportunistic patchwork is gradually transformed into organized plantations of palm oil and rubber. Pioneers are bought or pushed out by larger organisations that have acquired concessional access or land titles. In these situations, the focus is on legal compliance but auditing is difficult and breaches of codes continue. A growing awareness of the unsustainable practices followed in Riau has led to a growing global demand for sustainable products. Haze free palm oil and sustainably produced paper products are in increasing demand. As a response, some palm oil and wood pulp plantation owners have attempted to adopt more sustainable practices and begun to set areas for conservation. In this way, they aim to demonstrate commitment to a business model that extends ‘beyond compliance’. Schemes such as the Round Table for Sustainable Palm Oil (RSPO) and the Forest Stewardship Council (FSC) for wood origin certification have begun to provide standards for assessing compliance with sustainable practices. Swidden agriculture is sometimes called shifting cultivation and also incorrectly confused with slash-and-burn farming. Swidden is an ancient form of land use that involves the clearing of land for cropping, followed by a period in which the land is left fallow. Swidden cultivators return to the cleared plots for another cycle of cropping after an interval in which soil fertility is able to regenerate as leaf and plant litter restore forest the humus layer. Here is a short digest of news I’ve written for the PM.Haze October Newletter. A full list of past newsletters can be found on the PM.Haze site. The first part of my news analysis addresses an excellent article, How to fight the haze three times a day, written for the Straits Times by PM.Haze members Tan Yi Han and Maxine Chen. It is headed by this dramatic helicopter shot. Mr Tan Yi Han, 32, is a co-founder of People’s Movement to Stop Haze (PM Haze), a Singapore-based non-profit organisation empowering people to do their part to help solve the regional haze crisis. He is driven to help people find their passions, and to shape a society in which every individual stands up for what is right. Mr Tan recently obtained a Master of Science in Environmental Management. Ms Maxine Chen, 24, is a volunteer with PM Haze. She is inspired by writing and its power to drive positive change. A lawyer by training, her stories on topics including climate change and sustainable consumption have appeared in, among other places, the environmental science and conservation news site Mongabay. The article How to fight the haze three times a day reminds us that despite Indonesia’s national moratorium on peatland forest clearing, deforestation continues. Protected peatland forests, home to rare and endangered species like the Sumatran elephants and tigers, are still being illegally cleared and burnt to make way for oil palm plantations. Each dry season fires race across the peatlands producing masses of smoke and leaving behind a scorched earth ready for the planting of neat rows of oil palms. This smoke is a major contributor to global warming but it is also a toxic mix of harmful gases such as carbon monoxide, ammonia, cyanide and formaldehyde. It also carries microscopic particles coated with carcinogens such as polycyclic aromatic hydrocarbons (PAHs). Such is its toxicity that in 2015 it forced the closure of all Singapore’s schools and may have caused the early deaths of more than 100,000 people in South-east Asia. Palm oil is present in half the consumer products that we buy (packaged foods and personal care products), it is also the most commonly used cooking oil in Asia. Last year the survey PM.Haze conducted revealed that 32 out of 33 popular eatery chains in Singapore used cooking oil that contains palm oil. PM.Haze does not advocate boycotting palm oil but seeks to improve the way palm oil is produced. reduce unnecessary consumption of palm oil and other vegetable oils. Eat less fried food and choose less oily (and healthier) food instead. Reducing demand for vegetable oil is a key step towards driving down the need to clear more land. choose palm oil products certified by the Roundtable on Sustainable Palm Oil (RSPO). This certifies the palm oil is from growers that don’t engage in forest clearing and burning. In Singapore, there are already four brands of cooking oil that are RSPO-certified. Also, Ikea Singapore and the Singapore Zoo use sustainable cooking oil in their food outlets. tell others about the issue. Most of the eateries PM Haze spoke to were not even aware that they were using palm oil and mentioned terms like “vegetable oil” or “tempura oil” – generic names for palm oil. Consumers have the power to spur businesses to minimise negative impacts on the health of our people and planet. Let’s demand that businesses act responsibly and go haze-free. World Wide Fund for Nature (WWF) reports that two out of three Singapore brands they contacted failed to respond to a request to disclose their palm oil usage. WWF Singapore contacted 27 local retailers, manufacturers and food service brands with a survey to assess their buying and sourcing of palm oil. Only 10 companies responded. Ayam Brand, which uses only certified sustainable palm oil for its canned food products, and Wildlife Reserves Singapore, which uses palm oil for cooking in its food and beverage outlets, scored highest in the report. Since the launch of the campaign, these companies have committed to sustainable palm oil: Bee Cheng Hiang, Commonwealth Capital, Crystal Jade Culinary Concepts Holding, Paradise Group Holdings, Super Group and Tung Lok. WWF said the level of “non-discosure and lack of action” among brands in Singapore and Malaysia was higher than the global average. WWF-Singapore has launched a campaign to get consumers to pressure local brands on their use of palm oil, by sending emails to the companies via https://palmoil.sg. WWF Singapore observed that unsustainable practices in the palm oil industry are at the root of the transboundary haze and deforestation. It added that, the brands not using sustainable palm oil cited internal factors such as capacity issues and higher costs preventing a switch to sustainable palm oil. Sustainable palm oil options start at less than S$0.01 more per litre. Some historical narratives can be difficult to follow when they are punctuated by countless footnotes and bibliographic references, or broken by a frequent need to delve into appendices. Ian Burnet frees his work from these impediments. By seamlessly embedding his sources he has produced an almost conversational style. The result is an erudite narrative flow, free of distractions. Where Australia Collides with Asia chronicles the reflections and discoveries of great minds and adventurous spirits. Both Darwin and Wallace who feature read Humboldt’s Personal Narrative of Travels to the Equatorial regions of the New Continent. This work introduced the notion of a web of life where no single fact could be considered in isolation. Humboldt created a new genre in writing that eloquently described nature as part of this web of life. Ian’s book is firmly in such a tradition. It is not just a treatise on Alfred Russell Wallace any more than it is a static account of biogeography. He draws on his extensive knowledge of geology and his long engagement with the Indonesian archipelago to reveal a world shaped by tectonic dynamism producing countless variations and contrasts. Plate movements create areas that are distinct yet often close to one another. Both the Galapagos islands and the Indonesian archipelago display such features. In these places, biogeographic contrasts and transformations are easily observed. We learn that it was the distinct differences in distribution of flora and fauna along the archipelago, abruptly changing between the islands of Bali and Lombok that so intrigued Wallace. Through his research, he established this as a biogeographic boundary between Asia and Australasia. Darwin’s fear of challenging the literalist account of creation in Genesis certainly placed a break on this desire to publish. Wallace’s work pressed him to finally publish in 1859. All of this is and the warm friendship that developed between the two men is well covered, so too is their subsequent collaboration. The selection of photographs, maps and illustration in this publication not only add graphical power to the work but also display Ian Burnet’s meticulous patient gathering of archival material. As I approach my 70th birthday I find a need to consolidate my energy and spend time on those matters that present as the more serious and immediate. One of these matters is the health of our atmosphere and the allied issues of climate change and global warming caused by humanity’s over dependence on fossil fuels as sources of energy. Many industrial societies have been lazy, content to ignore the serious legacy of external costs, seeking quick profits through a dependency on apparently cheap fossil fuels like coal and oil. Neoliberal economics, with its magical trust in the market as the ultimate determinant of rationality and balance in the world, has gravely worsened matters. Several years ago when I came to live in Singapore it was with some uncertainty. This busy entrepôt with global connections seemed like a model of the market driven approach but this proved to be untrue. Governance takes an appropriate role and although this small island is by no means perfect, there is great concern for the environmental impact of change and development. Singapore has no extensive natural resources but it has a well-connected society made easier by excellent public transport and communications. With an average population density of 8500 people per sq. kilometre this is a much cheaper goal to achieve than in my own less densely settled city of Sydney with around 400 people per sq. kilometre. Green corridors are a feature of Singapore. Singapore also has a locational advantage at a pivotal point between the Pacific and Indian Oceans, at the head of the Malacca Straits. Alongside this is its highly educated population. Life in Singapore proved very comfortable, until 2015. That year, an El Niño year, the city was enveloped in smoke haze. A began blogging about this problem, first in September of that year as the haze grew in intensity then again in October. Around about this time I left for Bali which was well clear of the smoke haze. Not long after this a colleague from the ANZA Writers group that I convene mentioned a group called the ‘Mother Earth Toast Masters Club”. I went along to a meeting and it was there I met Tan Yi Han of the Peoples’ Movement to Stop Haze. Since then I’ve become involved with the group. I’m probably the oldest member the group has ever had, but I find nothing but acceptance and a willingness to use what little life experience that I’ve accumulated over the past 70 years. This month they featured my picture of me and ran a short interview with me under the banner Volunteer Spotlight: Russell. I hope you enjoy the read. ﻿#Tigers and orang utan are important but what about the #Indigenous people? Forest and peat fires in Riau, Indonesia Photo by Julius Lawalata, World Resources Institute. Sound of an approaching motor bike broke a long reflection on the devastation caused by fires that have raged across Indonesia’s peatlands in recent years producing suffocating smoke haze across the region. Joining an expedition to explore the causes of the smoke haze was sure to provoke such thoughts. Here on Tebing Tinggi Island, close to Riau Province’s Kampar Peninsula had also drifted to the fire regime in my own country. In my lifetime now a few months shy of three score years and ten the great warming was undeniable. Fire was increasing in incidence and I could only conclude that we were no longer theorising about global warming but dealing directly with it’s consequences. Our small group parted opening the way as a solitary man on a Honda step-through moved between us. This was a common event in many parts of Indonesia, but the man rode with a small sway-back pig trussed and draped in front of him. “Strange that he’s carrying a pig. Isn’t everyone here Muslim,” I asked the young man standing beside me. “He’s from the forest. His people don’t have a religion,” he replied. Forests too were important affording access to a realm crowded with forest spirits.This man no doubt followed such a primal path. In Riau, his people once called themselves Batin. They lived in swidden-clearings often close to rivers trading forest products downstream as Dayak groups did. Some came to be named after their rivers and, like other beings inhabiting the forests, were often forced from their places into areas of swamp forest or secondary re-growth. Habitat loss and endangered species were well documented, tigers and orang utan the iconic faces of this process. Yet, El Nino’s smoke haze, plaguing Singapore and Indonesia’s cities masked another tragedy the threat to Riau’s Indigenous people. Sadness and disquiet filled me. The man on the motorbike was travelling into a forested area. It seems that, as with the nearby people of the Kampar peninsula 20kms south on the mainland, he was Indigenous and most likely related. Where forests remain in this part of Riau the Indigenous people use them for hunting, charcoaling, fishing and small-scale farming, while supplementing their incomes with wage labouring for the concessionaires (oil, gas, logging and plantations). Most of the communities with customary territories on the southern side of the Peninsula were relocated to the northern side of the Kampar river. This isn’t a recent phenomenon in Indonesia. I saw it being applied back in 1988 when visiting the Mentawai Islands. Then people were taken from their Uma on the dendritic branches of rivers and concentrated in camps near the main branches. The same process is evident in Kalimantan. Despite this enforced relocation Indigenous people, all over Indonesia, still go back to their territories where they farm, hunt, fish, gather herbs, fruits and resins or do a little cash cropping. Many Indigenous people, in the Riau area will refer to themselves as Melayu at first asking but their roots lie far back in prehistoric times. In historic times they have been ruled by coastal Hindu, Buddhist and Malay kingdoms. Often referred to as Siak by the ruling kingdoms, they adopted the generic name Batin for themselves. They lived in swidden-clearings often close to rivers trading forest products downstream, just as Dayak groups did. Some came to be named after their rivers and, like other beings inhabiting the forests, were often forced from their places into areas of swamp forest or secondary re-growth. Riau has experienced one of the fastest rates of deforestation in Indonesia. When I attended middle school, 50 years ago it was known as an area of equatorial forest and swamp of great diversity but intensive resource extraction (logging, oil and gas) and conversion of forests to oil palm and pulpwood plantations means that today the province has lost over 80% of its original forest cover. HerStory3: Championing Community Land Rights and Indigenous Women’s Leadership in Asia, published by Asia Indigenous Peoples’ Pact. Click on the cover to download your copy. “This book, as a compilation of indigenous women’s “her stories”, is a reflection of the conditions and struggles on the ground of indigenous women. They are the stories of Katima, Jannie, Endena, and 13 other indigenous women who are extraordinary women in their own right. They are in the hearts and minds of other women and villagers because of their suffering, struggles, sacrifices, commitments, dedication and lifetime achievements in advancing the dignity of women and indigenous peoples. [i] Kempers, B. A. J. Monumental Bali: Introduction to Balinese archaeology and guide to the monuments. Periplus Editions. Singapore. 1991. pp. 4. From busloads of tourists and bustling beaches, to Balinese Hinduism and a global voice, Bali is a place that knows how to adapt. This is a summary of my introductory comments and a little more that there was insufficient time to express. As the only foreigner on this panel I’d like to say a little about misunderstandings. Recently Melbourne Barrister Jim Mellas posted this anecdote on. His Twitter stream.Uber driver: what sort of work do you do? Uber Driver: I like coffee! Where you work? I come for coffee. When I first came to Bali such misunderstandings were common enough for me. My friends were very forgiving. Misunderstandings arising from language were common in those days and continue but I was determined to learn as much as I could about Bali. So when I’m confronted with a statement as blunt as Bali is a place that knows how to adapt, in the interests of clarity and efficient communication many questions arise. First, what is adaptation. In biology – the process of change by which an organism or species becomes better suited to its environment. In evolutionary terms this is predicated on the existence of natural selection. In a social sense: the process of changing to better suit a situation. Now that makes sense Desa, Pala, Patra – adapting to time – place and context is a commonly understood principle in Bali and therefor a potential strength. There its no doubt that the connectivity and creativity of Balinese society affords a degree of resilience in the fast of major changes offering many opportunities for social adaptation, many creative solutions. Indeed the early emergence of cultural tourism in the Gianyar Regency, Ubud in particular, is one such positive adaptation, so too is the Ubud Writers and Readers Festival now in its 13th year. Events such as this add value to tourism, strengthen local capacities to respond and adapt to a changing world, to make a creative response to the the globalised industrial and post industrial economic system now so predominant. Where I must question Bali’s adaptability is in the domain of the biophysical environment, it’s management and the associated environmental mangement economics or the green economy where the answer to the question is problematic. At this stage I contend that Bali isn’t successfully adapting in this domain, but retain a significant degree of optimism, given the creativity of the human resources on this small island. I shape my answer to this question with spiritual, scientific and economic perspectives. “. . . to commit a crime against the natural world is a sin. When I first came to Bali, I hadn’t developed such insights, I brought my background in Geography and Economics but it wasn’t long before I came up against a Balinese spiritual tool Tri Hita Karana. (3) Humans and the natural world – Palemahan. Its roots are far more ancient, although this doctrine only came into wide use as recently as the 1966. My sense was that Tri Hita Karana could be applied in a material as well as a spiritual sense yet I saw many examples of lack of material harmony or equilibrium, particularly in the relationship between humans and nature. What I wasn’t understanding was the application of another set of understandings Sekala and Nislala. In the simplest sense this means that reality, is an interaction of the Seen and the Unseen. In time I came to accept this idea and have now completed my first book of short stories with this as the part of its title. Yet in accepting this idea it gradually became plain that harmonious relations between humans and nature were often mediated through ceremonies, through the Unseen realm and that for many this represented sufficient regard for the environment. This worked well enough in the pre-industrial world even though Bali was by no means sealed and impervious to outside influences. Fortunately, such external influences were for the most part environmentally non-disruptive, by comparison with the present. Things changed in the 1970s with the growth is wide bodied jet travel and the dawn of the era of mass tourism. In Bali before this era forces like Bhoma played their part within the unseen realm. As the child of Vishnu and Ibu Pertiwi, Bhoma is an entity whose place is intrinsically connected with the conjunction of earth and water. In terrestrial environments, earth, water, atmosphere and biosphere all meet. All four domains are present in a space where energy is exchanged and fundamental transformations in states of matter occur. In pre-industrial Bali it was easy for humans, much of what they did was in harmony with nature, so natural processes remained intact and unimpeded. All remained in equilibrium and Bhoma was free to carry out his work skimming across the earth and transforming rubbish into the food of life. So where are we now? Well Bhoma has indigestion, the heartburn of Tri Hita. The Bali I encountered, when I first came here has gone. My greatest fear is that given the high demand elasticity of budget tourism in South East Asia, and the mounting numbers of tourists escaping the polluted cities of eastern China and headed for Bali, that they will settle for tarmac, concrete and plastic, a Bali of Benoa Bay canal estates, an artificial and unsustainable paradise. The solution is in valued added tourism. 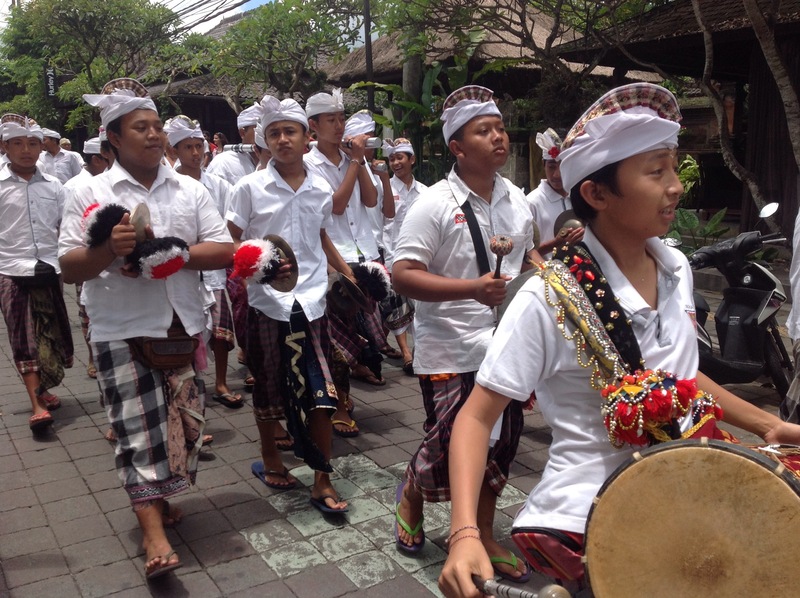 I’ve always believed that cultural, environmental and educational tourism is something Balinese society can do well. Perhaps there is hope in the Bali Clean and Green Program. What it must deal with and how effective it can be, I hope we will confront, in discussion. If it isn’t effective the answer to the question is an absolute no. I still want Bali to be the morning of the world, even if it’s moving into the siang, towards midday. Read more of my work by either picking up a copy of Seen and Unseen: a century of stories from Asia and the Pacific from me at UWRF16 or from Toko Buku Ganesha in Ubud. It’s also available through Amazon and as an audio book through CD Baby. Visit my website for full details. Seen and Unseen a century of stories from Asia and the Pacific is reviewed by Bill Dalton in Toko Buku on page 17 of the Bali Advertiser for October 26, 2016. View a Pecha Kucha on my work here. #Peatland and forest burning for palm oil production continues, but at what cost? Travelling through East Kalimantan in 1987 the extent of forest clearance was immediately apparent. On the road from Balikpapan to Tenggarong most of the clear-felled areas I passed were tantamount to a tinderbox waiting for a firestorm. Fire in logged areas was a regular occurrence in East Kalimantan and ten years after this visit, the inevitable happened. The El Nino of 1997-98 exacerbated yet another outbreak that went on to burn 25% of the province. In June the Straits Times reported that peatland fires in Kalimantan and Sumatra that blanketed South-east Asia in thick haze last year released the greatest amount of climate-changing carbon since record blazes in 1997, producing emissions higher than in the whole of the European Union. Recent research on the 2015 fires reported in the Straits Times concluded that 884 million tonnes of carbon dioxide was emitted in the region last year, with 97 per cent originating from forest fires in Indonesia. The results showed that regional carbon dioxide emissions from the fires were 11.3 million tonnes per day in September and October 2015, more than the 28-nation EU’s daily emissions of 8.9 million tonnes during the same period. The researchers also said the emissions were worse than during the 1997 fires, considered the worst on record. At that time, there was an even longer drought and widespread burning due to a stronger El Nino. Harvard and Columbia University researchers have used air pollution readings to calculate exposure to the toxic smoke haze that drifted across Indonesia, Singapore and Malaysia, last year. Their research suggests 100,000 premature deaths in Indonesia, Singapore and Malaysia, arising from this event. A combination of El Niño and pIOD conditions in July–October 2015 led to dry conditions that exacerbated agricultural and land clearing fires in southern Sumatra and Kalimantan. The resulting dense haze persisted across much of Equatorial Asia for weeks, imposing adverse public health impacts on populations in Indonesia, Singapore, and Malaysia. Using the adjoint of the GEOS-Chem global chemistry model together with health response functions, we estimate ~60 μg m−3 of population-weighted smoke PM2.5 exposure and 100 300 premature deaths across Indonesia, Malaysia, and Singapore due to extreme haze in 2015. These values are more than double the 25 μg m−3 of smoke PM2.5 and 37 600 premature deaths that we estimate for a similar haze event in the region in 2006. The approximate doubling of regional smoke exposure in 2015 compared to 2006 is consistent with observations of haze from both OMI AI and MODIS AOD during the two events. Conditions are becoming worse with the El Nino Southern Oscillation (ENSO) cycle and Indian Ocean Dipole (IOD) potentiating factors. The report notes that, “Exposure to air pollution increases the risk of death from a number of ailments including stroke and respiratory illnesses,” one of the researchers from Harvard University, Dr Shannon Koplitz, told Fairfax Media. Indonesians were the worst affected with an estimated 91,600 excess deaths. Last year Indonesia’s National Disaster management Agency (BNPB) acknowledged the severity of the situation reporting that hat 43 million Indonesians were affected by the smog in Sumatra and Kalimantan alone with 503,874 reported Acute Respiratory Infections (ARI). It seems Sutopo Purwo Nugroho has misunderstood the data which pointed to premature deaths, rather than deaths in the present period. Topsfield also quotes Erik Meijaard, an Indonesian-based honorary associate professor at the University of Queensland who says that “Indonesia’s fires are probably the biggest global environmental disaster of the 21st century”. Greenhouse gas emissions from peat fires in Borneo and Sumatra are currently exceeding emissions from the entire U.S. economy, putting Indonesia on track to be one of the world’s largest carbon polluters this year. According to the Global Fire Emissions Database (GFED) carbon emissions from Indonesia’s fires have just topped the CO2 equivalent of a billion tons. The findings bring into sharp focus the importance of ending business-as-usual approaches to land management in Indonesia if the world hopes to curb greenhouse gas emissions. While the health impacts are an obvious and continuing legacy of the rapacious forest burning there are other grave consequences. The impacts on endangered ecosystems and endangered animals, in particular, are well documented. Tragic as this is, particularly for animals such as the Sumatran Tiger and the Orang Utan, I’ve concentrated on less well known impacts. The WWF covers the issue of Palm Oil and Biodiversity Loss most thoroughly. Flooding in deltas and riparian lowlands is accelerated by the subsidence of peatlands. Subsidence commonly occurs when channels are cut through peat lands as part of the clearing process. Peat dries out begins to release sequestered CO2 and shrinks. This is well documented in the Straits Times article which reminds us that unrestrained forest clearance to develop oil palm and pulpwood plantations leads to land subsidence. Millions of hectares of Indonesia’s former forest lands are slowly subsiding and could become flooded wastelands unable to grow food or timber-based products in one of the world’s most populous nations. Combined with rising sea levels, the scale of the problem becomes even more stark because much of the east coast of Sumatra is just a few metres above sea level. It quotes Wetlands International which claims that between 70 per cent and 80 per cent of Sumatra’s peatlands have been drained, largely for agriculture. These peatlands will become unproductive so that, over time, almost the entire east coast of Sumatra will consist of unproductive land that will become frequently flooded, adding that this means the livelihoods of the local communities will be jeopardised, and industrial plantations will not be possible any more. Remediation is unlikely to be an option so the costs associated with this aspect of the palm oil industry are huge and inter-generational. Clearing any land in humid environments increases run off and reduces the percolation of water into soils. Run-off velocity in such situations also increases and without the protective forest layer erosion increases, top soil is lost and carried into water courses, streams and rivers. This in turn reduces the efficiency of channel flow, increasing flooding and also leading to increased siltation of estuaries and coastal waters. Such siltation can disturb coastal mangroves and associated fish breeding areas. River transport, coastal fishing and coastal navigation all suffer. Muhammad Lukman, in research towards his PhD, has identified elevated levels of polycyclic aromatic hydrocarbons in riparian and coastal sediments. He suggests that his findings could be evidence of the effects of widespread, long-term and intense agricultural burnings along with the many forest/peat swamp fires that have frequently occurred in the past 20 years or so. On 25 September, 2015, as haze hovered above AQI 300 in Singapore, schools and kindergartens were closed and protective N95 masks distributed. Levels of smoke haze pollution were far higher in Indonesia where schools had been closed in the previous month. In Malaysia the government announced that schools would be closed in areas with an AQI over 200. On Monday 5 October, 2015, Detik online reported that in Pekanbaru, capital of Riau Province in Sumatra, schools had been closed for more than a month owing to the smoke haze. Finally the Department of National Education Pekanbaru forced students to go to school despite the smoke haze. Such a cyclical problem will cause significant disruption to educational services and the development of human resources, particularly in Indonesia. Closure of airports and disruption of airline schedules. During the burning season 2015 flights were frequently cancelled at Sultan Syarif Kasim II (SSK II) airport Pekanbaru, in Riau province with visibility down to between 300 to 600 metres in the area. Elsewhere Kuching International Airport (KIA) in Sarawak, Malaysia was closed on September 10 with visibility down to some 400 metres. In Indonesia, poor visibility due to smoke disrupted flight schedules at Pinang Kampai Airport, Riau. All of these events have direct measurable impacts. Last year Reuters quoted Irvin Seah, DBS economist in Singapore, who said, In 1997, the level of pollution was not this severe, and noting that the tourism industry’s contribution to the economy was relatively smaller back then. The Reuters report observes that Tourism makes up 6.4 percent of Malaysia’s economy and about 5 to 6 percent of Singapore’s and quotes an ANZ research report that says, in Singapore, Shopping, restaurants, bars and outdoor entertainment will all suffer during this hazy period. Among the events disrupted or even cancelled due to the haze were the 2015 FINA Swimming World Cup in Singapore and the Kuala Lumpur Marathon in Malaysia. While losses in tourism and ancillary sectors can be calculated there are increased costs to businesses across the board. Developing and implementing disaster relief plans for employees is one area that is immediately obvious, then there are the issues of work days lost owing to respiratory or cardio pulmonary illnesses, disruptions to supply chains and various other schedules of usual business activity. Finally there is the matter of impacts on ventilation and air conditioning filtration systems particularly in Indonesia, Malaysia and Singapore. This was also broached in the previous post Forest Burning and haze in Indonesia, Malaysia and Singapore. The precise impact of any one burning event is difficult to judge, but the immense quantities of carbon stored in the peatlands of Indonesia is cause for concern. One estimate suggests that Indonesia’s 1997 fires released 810 to 2,670 million tonnes of carbon into the atmosphere, the equivalent of 13 to 40 per cent of the fossil fuels emitted worldwide that year. In a report entitled ‘Indonesian haze: Why it’s everyone’s problem’ on 18 September, 2015, CNN observed that, it’s a persistent, annual problem that disrupts lives, costs the governments of Indonesia, Singapore and Malaysia billions of dollars, and leaves millions of people at risk of respiratory and other diseases. The land that burns is extremely carbon rich, raising Indonesia’s contribution to climate change. The CNN report also reminds us that in 2014 Indonesia was ranked the world’s sixth worst emitter of green house gasses.